A black male walks up to a restaurant counter and asks for a cup of coffee. The white waitress behind the counter snubs him and attends to the white female who comes in after him. “Excuse me. All I want is a cup of coffee,” pleads the black customer as the waitress rolls her eyes and ignores him. As the waitress continues to disregard the requests of this customer, his protests grow progressively louder and he gets more visibly frustrated. As the customer eventually storms away from the counter, the dozen or so onlookers all have a good laugh. After all, the waitress and customer are just seventh graders, and the counter is just a desk in Gretchen Brion-Meisels’ language arts class at Fletchard Maynard Academy, which is only a stone’s throw away from MIT’s campus. On this day, her students are participating in discussions of race and diversity with MIT students as part of a class project in the Martin Luther King Jr. Design seminar (17.920). When asked to define discrimination, one seventh-grader answered “it’s a way to judge people in a way that’s not cool.” Although some students giggled when the topic of stereotypes and prejudices against sexual orientation was mentioned, the students discussed their own experiences with discrimination and performed skits about class-ism, racial discrimination, and gender discrimination. “To make broad assumptions about different people is just wrong. There are different ways to combat the stereotypes, injustice and discrimination that are everywhere, and you guys aren’t too young to make a difference,” said N. Ijeoma Ezeofor ’06. Examples of discrimination and stereotypes that exist seem all the more harsh when performed by seventh graders. From a minority job applicant whose resume is torn up to lower expectations for girls playing sports, the message is pretty clear that these students are familiar with situations that actually still occur in the real world. “A good lesson to learn from these skits is that these situations can be switched around. Anyone can be discriminated against,” Louis D. Fouche ’07 told the class. The presentation ended on a note of encouragement for the students to be proactive in dispelling stereotypes and playing an active role in their community. “Soon you’ll all be old enough to vote, and make sure you take advantage of that. A lot of people fought for a long time to give you that right,” Christopher L. Smith ’06 said. The time that MIT students spent with the students illustrate the benefits of mentoring young people. The same group of MIT students also visited the Morse and King schools in Cambridge and addressed similar topics through discussion and a role-playing activity on privilege and social class systems. The MIT Public Service Center has several mentoring programs which target children and young adults of all ages, many of which take place on MIT’s campus or qualify for federal work-study funding. “What I hear a lot from MIT students is somebody made a difference to them and they want to make a difference to somebody else,” Susnowitz said. However, Susnowitz gives the advice that because mentors can be so important to a child’s life, anyone interested should make sure that they choose the right opportunity that fits their schedules. “We try to have a range of opportunities so that people can make a commitment they can keep,” Susnowitz said. 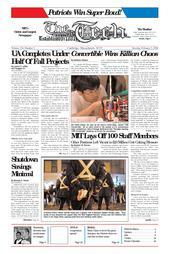 For more information about mentoring programs, visit the MIT Public Service Center’s web site at http://web.mit.edu/mitpsc. The PSC is located along the infinite corridor in room 4-104.